We put seven of the best camping knives to the test. After months of field testing and rigorous experiments, our Top Pick was the Morakniv Companion. At only $19 retail as of this writing, this knife is tough, versatile, and can handle any camp task with ease. 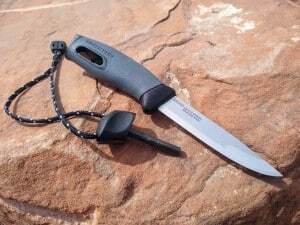 For those who plan to abuse their camping knife with heavy-duty use, we loved the KA-BAR Becker Campanion. It’s a serious, durable, well-made knife for larger camp tasks like splitting firewood. 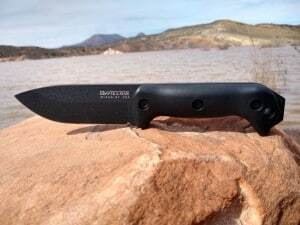 The Schrade SCHF 36 Frontier won our Honorable Mention award for being an incredibly tough, well-thought-out, and affordable heavy-duty camping knife. Note: If you’re looking for smaller, lighter knives you can take on a backpacking trip, check out our guide to the best backpacking knives. 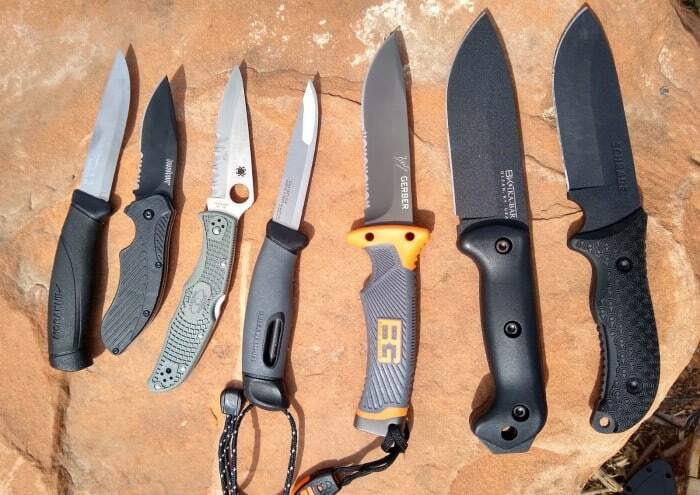 The seven camping knives we tested. 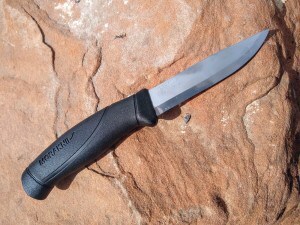 The Morakniv Companion was our Top Pick all-around for a camping knife. It’s simple, versatile, and compact, and it performed all the essential camp chores we needed and then some. This knife almost immediately became the first knife we’d grab for just about anything around camp. We’re honestly not sure how we ever got by without it. It had one of our favorite grip shapes, with a rubber handle that nestled perfectly in any size hand. The blade was one of the sharpest right out of the box and sliced like a dream through tomatoes, onions, and whatever other veggies we put it up against. The stainless steel is easy to clean and maintain, making this knife perfect for going from whittling wood to chopping vegetables. For less than $20, this knife held up amazingly well to intensive tasks. We’ve used this knife on a few occasions to clean freshly-caught fish. One of our testers once made an entire backpack frame out of Juniper branches with a Morakniv Companion. We didn’t have a lot of negative things to say about this knife. It’s clearly not designed for really heavy-duty tasks, so if you’re looking for something you can use to bring down small trees in a survival situation, check out our recommendation below. The Companion also requires fairly frequent re-sharpening. After a month of testing, it had dulled slightly, and we got a small bend in the edge from chopping on a hard surface. Still, the blade is easy to work and resharpen to a razor edge. If you’re only going to buy one camping knife to do everything, this is it. The KA-BAR Becker Campanion is a beast of a knife. Weighing a full pound and with a solid full-tang construction, this knife is ready to rumble right out of the box. It feels well-balanced and basically indestructible, and all of our testing confirmed that impression. We were able to plow through a 2″ thick branch in less than 10 seconds with this knife. The only other knife in our test that came close in woodcutting ability was the Schrade Frontier, which took longer to get through a slightly thinner branch. The KA-BAR Becker was also excellent at batoning through firewood. It split multiple hard cedar logs better than some of the camp hatchets we tested. We loved that the steel extends slightly beyond the handle, making a perfect hammer for tent stakes. The knife is made of 1095 Cro-Van steel, which is very hard and durable. However, it isn’t a stainless steel, so rust is a potential issue and this knife requires a bit of maintenance. The coating is durable and held up to abuse without chipping or wearing. It did, however, pick up a lot of gunk from chopping through wood and was hard to completely clean. This was the last knife that we’d want to prep our food with. Its thick blade made it one of the slowest in our cutting speed test, but that thickness is what makes it tough enough to chop through firewood and tree branches. Another minor gripe with this knife is that the sheath is extremely tight. When we first got the Campanion, multiple people tried and failed to remove the knife from its sheath until we used a hairdryer to soften the plastic. Even after working the plastic to loosen it, popping this knife out of its sheath still takes a considerable amount of effort. This seems to be a common issue with a particular batch of sheaths. If you want a tough-as-nails knife that can chop like a machete, split wood like a hatchet, and hold up to hard work around camp, then the KA-BAR Becker is the perfect option. 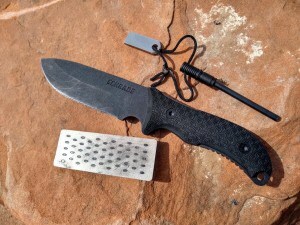 The Schrade SCHF 36 Frontier is a lot of knife for the price. It’s a burly, full-tang knife that also comes with a sharpening stone, a ferrocerium rod and striker, and a decent sheath to hold it all. We loved the finger notch directly beneath the blade. It provided a comfortable, ergonomic hold for more precise tasks. When chopping through branches and splitting firewood, it did impressively well for a knife that we were able to find on sale online for less than $40. It didn’t feel quite as solid as the KA-BAR Becker, though. 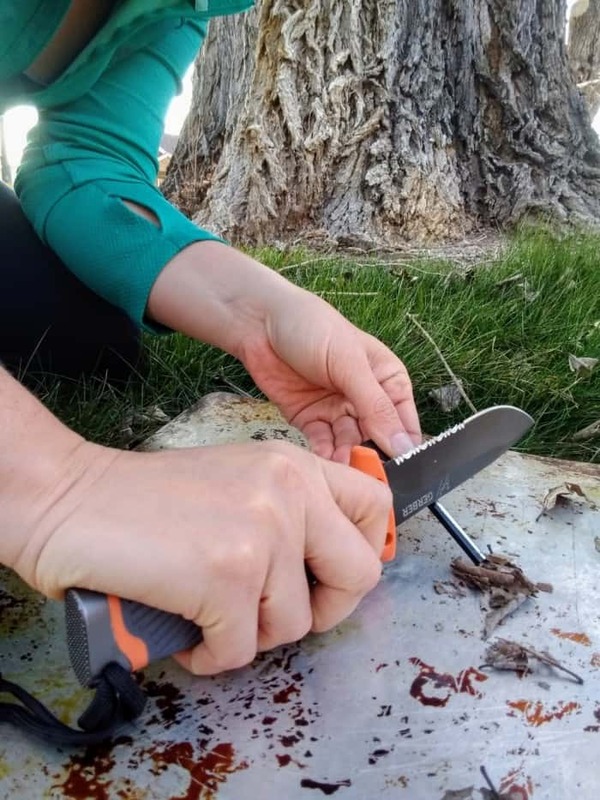 The Schrade lacked some of the heft that made the Becker such a powerful tool, and it took us a little longer to get through branches and firewood. 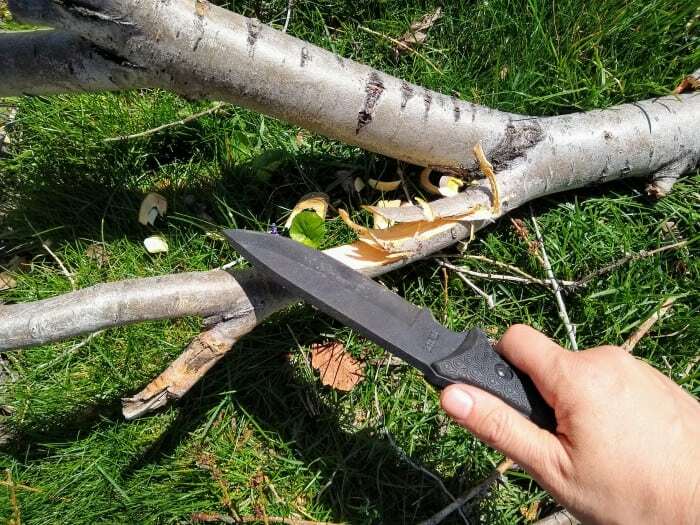 Chopping branches with the Schrade SCHF 36 Frontier. It took us a little longer to get through branches and firewood with this knife than with the KA-BAR Becker Campanion. Its coating wasn’t as durable as the KA-BAR’s, and we noticed a few chips and scratches after a month of use. It also wasn’t as well-suited to hammering in tent stakes with its rounded base. Like the KA-BAR, this knife’s wide blade isn’t really designed for food prep. It can handle it, but it’s made to be a workhorse camp knife, not a kitchen knife. Still, this knife doesn’t mess around. For the price, you get a high-quality and tough knife, as well as a decent sharpener and fire starter. If you’re looking for a heavy-duty knife without the KA-BAR’s price tag, this is a safe bet. The Spyderco Endura 4 is an incredibly sharp and durable folding knife that feels solid and well made. 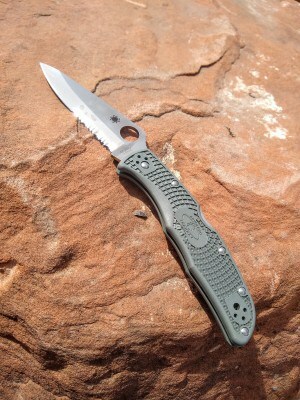 The Spyderco Delica 4, which is essentially a smaller version of the Endura 4, was our Top Pick for backpacking knives. We liked this knife for all of the same reasons. The Endura 4 opens and closes with a smooth, snappy feel. Its thumb hole makes for easy one-handed opening. It’s razor sharp right out of the box, and just as comfortable carving wood as it is slicing open packaging. It was right at home boring holes in wood, carving out notches for improvised tent stakes, and slicing through thick cordage with its serrated edge. It wasn’t the most comfortable knife to use for food prep — the grip and style just didn’t lend themselves well to chopping vegetables. But the Endura 4 has a very generous handle, and it’s well-suited to people with large hands. If you want a tough, sharp, and well-made folding knife for around camp, you can’t go wrong with the Endura 4. Billed as a survival knife, the Gerber Bear Grylls Ultimate Fixed Blade Knife comes with a myriad of tools, including a whistle, a sharpening block, a ferrocerium rod, and a (very) basic survival guide. If you’re looking for a decent and versatile knife, it’s a solid option. It was far from the sharpest camping knife in our test, but its long blade and partial serration made it lightning fast at heavy-duty cutting tasks. It also has a hard metal pommel on the end that can be used as a hammer, which came in handy for pounding in tent stakes. A number of other reviewers mentioned a lack of durability in the pommel hammer. Despite putting it through the wringer on tent stakes, tree stumps, and even a couple of rocks, we didn’t have any durability issues. This blade is not as heavy-duty as either the KA-BAR Becker or Schrade Frontier. Still, it’s a much more versatile knife. Its partial serration worked well for sawing into branches, while its stainless steel construction handled food prep and other basic camp tasks passably well. It also worked extremely well for fire starting with its included ferro rod. The Bear Grylls Ultimate Knife is a jack of all trades, master of none. It wasn’t as powerful for heavy-duty use as some of the other knives in our test, nor was it as comfortable in the camp kitchen. But overall, it’s a good camping knife that manages to be both tough and versatile. The Light My Fire Swedish FireKnife lives up to its name. It was far and away the best at getting a fire started, sending an impressive shower of sparks onto our tinder with minimal effort. We liked the way that the included ferrocerium rod locks into the handle for storage. For tasks other than fire starting, though, this knife was nothing special. While the handle and grip felt very similar to the Morakniv Companion, the blade itself was a little lacking in comparison. In our paper test and cutting speed test, it was consistently a touch behind the Morakniv. Where we really noticed the difference was in food prep. The FireKnife didn’t slice anywhere near as smoothly and effortlessly as the Morakniv. Overall, we think it’s a decent knife with a lot of similarities to the Morakniv, but its main strength is the ability to start a fire. If that’s your priority, this is an excellent knife to have. Otherwise, we’d recommend the Morakniv Companion over the FireKnife. The FireKnife’s stowable fire starter removes from the handle with a simple twist. We’ve always been a fan of Kershaw knives. The Clash is one of their entry-level, affordable models. Its blade is impressively sharp, and the partial serration makes it a mean cutting tool despite a comparatively short blade. It also has a comfortable and natural grip. It didn’t feel quite as stable or solid as the Endura 4, and the assisted open felt slightly clunky. The materials didn’t seem to be quite as durable as other knives in our test, either. The Clash showed noticeable wear on the clip, the assisted open lever, and the handle after a month of use. It did passably with food prep tasks, although the partial serration and short blade gave us a pretty limited edge to work with for cutting veggies. The Clash retails at $57.74 as of this writing, but we’ve regularly seen online it in the $20 range. At that price, it’s a solid knife and worth having in your pocket around camp. Fixed Blade – For camping knives, where weight and size aren’t a huge issue, fixed-blade is our preferred style. Quality fixed-blade knives are stronger and more durable than folding knives. A good full-tang fixed blade knife (where the steel of the blade extends all the way to the end of the handle) is a simple and virtually indestructible tool, ideal for heavy-duty or survival usage. Folding – Compact, easy-to-carry, and lightweight, folding knives have the benefit of being able to slip into your pocket for easy access. Although fixed-blade knives are generally easier to use for food prep and more stable for heavy duty camp tasks, there’s a lot to be said for the convenience of a good folding knife. You’ll often see knives described as half-tang or full-tang. In fixed blades, tang refers to how far the steel of the knife extends into the handle in one solid piece. Half- or quarter-tang knives are fine for most camp tasks, and if they’re well made they can be very stable. Full-tang knives offer much greater stability and durability for heavy-duty tasks. You may also see “rattail tang” or “stick-tang” knives, which means that the steel of the blade narrows to about a centimeter in width and extends the length of the handle. Most knives are made from steel, but the market is filled with hundreds of varieties, each with its own unique characteristics. It’s beyond the scope of this article to describe all the varieties, but it’s worth taking a minute to research a steel type to see if its qualities suit your needs and usage. In general, softer steels will shape easily into a razor edge and will be easier to sharpen, but they tend to be less durable and lose their edge quicker. Harder steels, on the other hand, are more durable but difficult to sharpen. A lot of high-quality knives are made from non-stainless steels. Non-stainless steels can be easier to sharpen in the field without any specific tools, and they usually retain their edge better. However, they are prone to rust and require a little more maintenance. Stainless steel, on the other hand, is easy to maintain but generally harder to sharpen. Some blades have a coating over the steel. This hardened material protects the blade, increases durability, and adds visual appeal to the knives. However, coatings make it impossible to use the spine of the blade on a fire starter, forcing use of the blade itself if no other striker is available. These coatings can also be hard to clean, and (depending on how durable the coating is) they can chip or grind off as you sharpen the knife. Pretty much every knife is capable of sparking a fire on a ferrocerium rod, but some are a lot better at it than others. Some knives have special edges carved into their spine specifically for the purpose of striking a spark. With others, especially knives with a coating, you may have to use the blade. This can damage the blade if done too often. Before anything else, we tested each knife’s sharpness right out of the box. A sharp knife should be able to slice through a piece of standard printer paper cleanly with minimal effort. The more snagging and catching, the duller the knife. Thick cardboard is a challenge for knives due to its abrasive and inconsistent surface. We timed how long it took to cut through a 2-foot section of cardboard with each knife. We measured the number of strikes it took on a ferrocerium rod to get a ball of dryer lint to ignite. If we were unable to get a spark from the spine of a knife, we used the blade. Lighting tinder with the Gerber Bear Grylls Ultimate Fixed Blade Knife. Only a few of the knives in our test were tough enough for heavy duty tasks like splitting firewood or chopping through branches. We pushed these knives to their limits and describe the results in the reviews above. Splitting wood with the KA-BAR Becker Campanion. We brought these knives on camping trips (and even a few backpacking trips) for over a month, using them for camp tasks from chopping food to splitting firewood. We made sure to spend some time with each knife whittling wood, chopping vegetables, and cutting cordage. Stephanie grew up in Pennsylvania and is a life-long adventurer. She has taught English in Taiwan; backpacked through Asia, Europe, and South America; worked as a North American tour guide; mentored at-risk teenagers in Utah’s wilderness; and worked as an outdoor educator for elementary school students. From her current base camp in Salt Lake City, Utah, Stephanie spends most of her free time backpacking, hiking, climbing, and exploring the mountains and deserts of the American West.